As I basked in the afterglow of Thanksgiving this year, I thought back to last year and the 10-Hour Vegetarian Pot Pie (otherwise known as the Worst Thanksgiving Food Ever To Grace Our Table). This year's Thanksgiving couldn't have been more delicious, wonderful, or more different from any Thanksgiving Marc, Wyatt and I have had as a family. We were three out of sixteen guests at my cousins' home. Many of the guests were my relatives, but some were not, and all of them were interesting, kind, funny and great eaters. I loved eating the things I'm not good at cooking, including turkey, dressing, gravy, and pecan pie. I also loved eating the foods I thought I was really good at cooking, like mashed potatoes and cranberry sauce, because, as it turns out, mine are not as good as theirs. I've never been so glad we brought bottles of wine, and I have already written a thank you note to our hosts. With any luck, we will become part of their Thanksgiving tradition for ever and ever amen. Just like at the family reunion this year, I have no photos of our dinner or brunch gatherings. 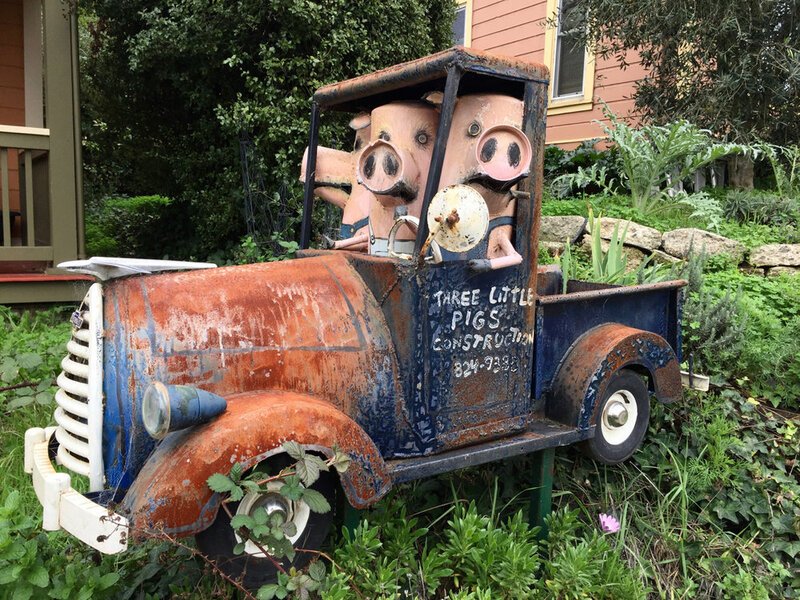 But I did get some photos of Patrick Amiot's outstanding junk art near the house where we stayed overnight. Marc also got some after dark. One Thanksgiving lesson I'm taking with me as we launch headlong into the holiday season is: There's no reason for me to make (or do) everything myself. For example, other peoples' food might be better, it is more fun to do things with friends, and it's easy to improve on holiday traditions if we all bring more joy into the celebration. This lesson applies equally to making gifts. Don't get me wrong—I love homemade gifts and I love making them for special people who will treasure them. But some handmade gifts are worth making myself, and some handmade gifts are worth buying. One item that is definitely worth buying is this beautiful trivet from Vilt Van Ver (Dutch for "Felt From Far"). You can purchase trivets, coasters, and other products from various retailers, including this one. Vilt Van Ver's products are stunning, totally handmade, sustainable, and fair trade certified. The trivets are only $39, which is a screaming deal. How do I know? Keep reading. When Wyatt and I went to the Museum of Craft and Design in August, I spotted a stack of Vilt Van Ver trivets in the (amazing) gift shop. Each was $40, and as Wyatt and I looked at one, we discussed the felted garland Benjamin had made for Wyatt, and we said, "We could TOTALLY make this." I also recall naively thinking that $40 was kind of steep for a felted-ball-trivet. (It isn't. Forty bucks is a steal.) So I took a photo of the trivet on the shelf, and we went home where I did some research about making felt balls. I also checked the Vilt Van Ver website for details, like dimensions and number of balls required. After learning each trivet requires 100 felt balls, I inexplicably decided we'd make two trivets, one for each of Wyatt's kindergarten teachers. After all, it was only August, and how long could 200 felt balls take? Ha. We bought our first eight ounces of wool roving (for $40, or the retail price of a trivet, for anyone who's keeping track), and I figured out through trial and error that each ball would require two grams of roving. From there, a little math showed one trivet would require almost this entire eight-ounce bag of roving. So, I knew that eventually, we'd need more wool. I also started to wonder if the project would get the better of us. Each ball was taking about 15 minutes to felt. But I got faster. After about a zillion balls, I could hand-felt one two-gram ball of wool in about three-and-a-half minutes. Wyatt required about 30 minutes per ball; he was down to about 15 minutes by the bazillionth ball. We bought eight more ounces of multi-colored wool roving (from a different retailer, this time for $20) about a month later. Most days through September and October, we rolled a few balls and then set them in a sunny window to dry. We made felt balls inside the house and out in the garden. Whenever there was a spare moment or couple of hours, we were felting balls. Fun fact: Even when a felt ball feels dry on the outside, it is still not dry! Mold dulled our earliest, vibrant, woolly balls, all because I left them together in a bowl, on top of each other, for a few days after they seemed dry. We soon started leaving the balls in one layer in a giant glass baking dishes because NOBODY wants moldy balls. Once all the balls were made, we rejoiced for a week with the following call and response: "Guess what we don't have to do today?" "MAKE FELTED BALLS!" Even better, the cracks in my hands from all the felting in hot water and dish soap finally began to heal. To make the trivets, we sorted the balls by color, and then strung each ball, one by one, onto upholstery thread, ten balls per thread. I then assembled the twenty strings of ten balls into two trivets. I pulled all the strings tight, had to restring a few, and I used a needle-felting tool to hide the knots on the ends of each of the strings. The trivets turned out well. They are imperfectly beautiful, because even after felting so many balls, only the occasional ball turned out perfectly spherical and wrinkle-free. Wyatt's were often better than mine, but as grown woman with a sense of time and my own mortality, there was no way I was spending 30 minutes (or even 15 minutes) per ball. We finished ahead of schedule, completing the trivets before Thanksgiving. The balls did not beat us, but it's only because I stubbornly refused to let them win. I am happy we completed the project. We made great gifts, and Wyatt and I experienced thanks to hours (and hours) of our own work and shriveled fingers, the value of skilled artisans who make beautiful things. Basically, Velt Van Ver deserves our business. We decided to give the teachers their trivets on the Friday before Thanksgiving break. One reason for giving the gifts early was so that they could enjoy the trivets now and through the holiday season. Our other reasons are much less laudable, involving ego and pride. Making trivets out of 200 hand-felted balls was a bonkers (and enormous) undertaking. Those trivets (and we) needed our own day of gift-giving to shine.